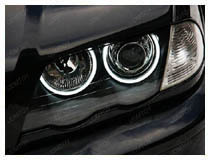 These angel eye rings (also known as corona rings by BMW) are fiber optic rings that reflect light within itself to create a uniform ring of light around the low and high beam lights. 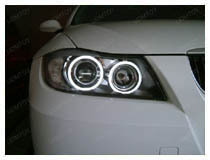 iJDMTOY carries the most complete BMW angel eye products for all the BMW models in varieties of designs such as CREE LED Angel Eyes, Osram LED Angel Eyes, RGB Multi-color LED Angel Eyes, etc. Why are Outer Aftermarket Halo Rings Dimmer Than the Inner Ring? There is a ring marker bulb located in the inner ring housing. When it lights up, it provides a direct illumination for the inner ring. However for the outer ring, the light needs to travel thru the fiber optics tube, therefore it will appear weaker than the inner ring no matter how bright this LED angel eye bulb is. Is the Outer LED Halo Ring Barely Lighting Up? Modifying your vehicle has never been easier with our collection of products. 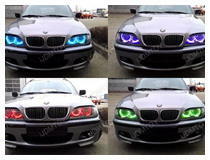 We have a variety of items, including our BMW angel eyes and halo rings. These are fiber optic rings that reflect light to create a ring of light around the low and high beam lights. 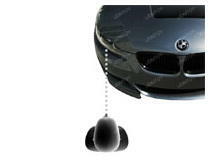 While this is an added safety feature, as this allows your lights to be more easily seen, it is also a popular modification to BMW models. 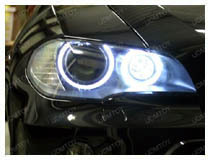 We offer a variety of BMW angel eyes and halo ring lights to choose from. We have options ranging from basic to high tech, including options that are Wi-Fi remote control operated. The Wi-Fi enabled options are the most high-tech offered, and are the best in our selection for upgrading your BMW. Our options are all easy to set up, as most include plug and play installation without any hassle. Our Wi-Fi enabled options also include an easy smartphone setup, making this a very simple modification. You can choose from a variety of colors, including white, red, green, blue, yellow, cyan, and magenta, depending on the option you choose. 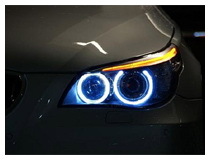 Standard BMW angel eyes are in a bright white, but we have options for everyone, that way you can customize your vehicle to your exact specifications. 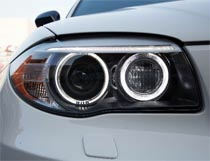 Customization has never been easier with our BMW angel eyes and halo rings. Many of our options are the brightest on the market, and will last longer than the HID options available. Our halo rings work for both low beam and high beam halos, and we have handy installation guides to help you with every step of the modification process. Here at iJDMTOY, we know your car is more than just a vehicle, it’s a part of your life, and it needs to be treated as such. If you have any questions about which product is best or have any issues with your order, please feel free to contact our customer service representatives. They will be happy to answer any questions you have.